rec. October 2014, Maison Symphonique, Montréal (Québec) Canada. Gustav Mahler’s final and unfinished symphony, the Tenth, has its own magnetic attraction. The first Adagio movement was the only one to be left complete, but sketches of the remaining four movements were advanced enough for musicologists to create performing versions of the work as a whole. Deryck Cooke’s edition is perhaps the best known of these, and remains arguably the most successful. There can be little doubt that Mahler himself would have made his own changes to this symphony in a final version, ironing out flaws and sealing the orchestration with his own unique sonic fingerprint, but what we have is a convincing and powerful musical statement. Claudio Ricignuolo’s booklet notes for this release remind us that Mahler’s anguish towards the end of his life included what is termed a “grave conjugal crisis”, with his marginalia on the manuscript reflecting some of the emotional turmoil expressed in the music. 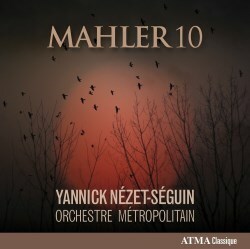 Well recorded, the Orchestre Métropolitain conducted Yannick Nézet-Séguin make for an excellent team. The strings aren’t quite as thick and glossy as, say, the Berlin Philharmonic, but nor are they weak partners to characterful wind and brass. All would seem to be well, but if you know this music then you might find your attention wandering fairly soon. The Adagio somehow seems to miss that keen edge of emotional brinkmanship which keeps our teeth clenched even when the music relaxes into quasi-salon Viennese atmospheres. Those tensions between the utmost pain and the beauty of reminiscence aren’t etched with quite the eloquence of contrast that can be heard in some other recordings. That remarkable outburst later in the movement, in this case at 18:30, can and should rise as a defiantly shaken fist, the answering chords a terrifying echo from an unmentionable abyss, but with this performance we’re not quite transported beyond a portrait of defiance, and reflections in a dark and unsettling lake rather than an infinity of loss. This is all rather subjective, but these impressions are gathered by way of comparison with some alternative recordings to which I will come later. In isolation and on its own terms this Canadian production is very fine throughout. The Scherzo has zip and energy without being tumultuously swift, with nice details in the contrasts between chamber-ensemble passages and the full orchestral sweep. There is a well-paced Purgatorio, that unexpected title for such a brief and relatively amiable Allegretto moderato. The booklet notes point us towards a collection of poems in which there is a sequence of poems with the same title, on the subject of infidelity in love. The knives sharpen once more for the penultimate movement, a Scherzo filled with passionate eloquence and moments of almost nonchalant tenderness amongst those potent tensions. A doom-laden bass drum signifies the opening of the Finale, and while these are captured well the ear is made aware of the limited acoustic in Montréal’s Maison Symphonique. There are some beautiful solos here, and the flute sings sublimely over its cushion of strings early in the movement, each section blending well in those crucial quieter moments. There are one or two places here and earlier on in the symphony where the upper strings slightly miss perfection in ensemble which is a shame, but not too distressing. As far as recordings of Deryck Cooke’s realisation of Mahler’s Tenth Symphony goes this release comes up against some stiff competition. Chailly with the RSO Berlin on Decca (review) is very fine, as are both of Sir Simon Rattle’s recordings – the 1980 one on EMI with the Bournemouth SO and later with the Berlin Philharmonic (review). As with other reviews of this work I once again refer readers to Tony Duggan’s survey, but as with all such documents it would have needed updating almost as soon as it was posted, such is the catalogue for this work at the moment. My main reference for this review has been Riccardo Chailly on Decca, and it is in his recording that I hear more of the vibrancy and that life-or-death feel which makes this whole symphony stand or fall. I would be the very last person to say that Nézet-Séguin’s recording is a failure, but it ends up sounding too easy-going to be a real favourite in my book. Just to take a couple of points, if you listen to Chailly’s Purgatorio you notice where a slightly slower tempo and more time taken over accents can cast a darker shadow over those jaunty rhythms. The sonic layers are tellingly deeper in a movement like the Scherzo, giving greater weight to those extremes of contrast, the orchestral playing sounding just that bit more ‘Mahlerian’ – that slightly breathless impetus that makes us feel we can barely keep up with that vivid and fast-changing imagination. Chailly’s bass drum in the Finale does have an odd, processed sort of sound, but even though this is one of the movements I feel Mahler would have intervened most between this and a finalised version there is a more realistic sense of drama around this Decca recording, a feel of unique occasion rather lacking from Montréal. In short and looked at every which way, this recording didn’t move me – neither to tears of distress nor to hide behind the sofa in terror. It may affect you entirely differently but such are the joys of individuality.